THE remarks made by driver of the taxi we had boarded set the tone. “Saab why are you going to that Muslim locality” was his refrain, once we informed him of our destination. This is what Varanasi has been turned into. A communal cauldron. Deep runs the mistrust. The BJP’s decision to field Modi from Varanasi is only going to widen this divide. 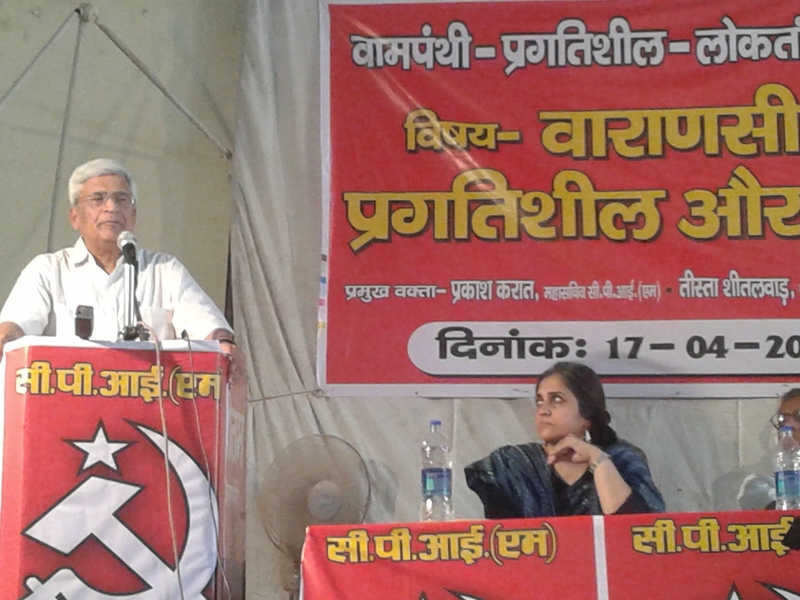 Dwelling on the history of communalism in Varanasi, CPI(M) general secretary Prakash Karat recalled the build up to the 1991 Lok Sabha elections, exactly 23 years ago. In that Lok Sabha election the CPI(M) had put up a candidate, Rajkishore. The BJP was the main opponent. Six months prior to this election, Advani had launched his rathyatra, consequent to which communal violence broke out in major parts of the country. Two days before the polling, riots broke out in Varanasi. The CPI(M) and the democratic and secular forces in the city fought against the BJP and the communal forces. He was addressing a convention of intellectuals and prominent people of city, against communalism in the context of the Varanasi Lok Sabha elections on April 17. After 1991, Karat said, “the RSS and the VHP gave the slogan of `Ayodhya, Kashi and Mathura’. Now after Ayodhya, Kashi (in Varanasi) is their target. This is the significance behind Modi contesting from here. He could have fought from a seat in Gujarat and won. The RSS and BJP are behind this”, he warned. About Narendra Modi choosing to contest from Varanasi, Karat said that “There is an obvious political message in this. The BJP and the RSS are signaling that aggressive Hindutva will be their plank. There is a menacing symbolism in Modi contesting from Varanasi apart from fighting from Vadadora,” he said. The symbolism behind Narendra Modi contesting from the largest state in the country is to send across a signal to the Hindutva forces that if the BJP is voted to power the Hindutva agenda will be implemented, Prakash Karat warned. Saying that it was a “calculated move”, he said since the 2012 assembly elections in the state, several riots have taken place in Uttar Pradesh beginning from Kosi Kalan to Muzaffarnagar. All these were planned and executed in a systematic manner. The BJP, he pointed out “has created a communal polarisation in the entire state”. Prakash Karat said that the fight here is not against a BJP leader, not against any RSS pracharak, but “for the future of the country”. The battle is not against “communalism alone”. For the first time, all the corporate houses are unitedly supporting a candidate, Modi. This has dangerous portends, he warned. On the issue of putting up a common candidate against Modi, the CPI(M) general secretary said that if the secular parties had come to a common understanding on a candidate, the CPI(M) would have withdrawn from the contest. But this has not happened. Since 1991 when the communal build up took place, the BJP has been continuously winning the seat except for 2004 when the Congress won the seat. Even in 2009, when the BJP’s Murli Manohar Joshi won the seat the BJP secured only 30.52 per cent of the vote; the BSP’s Mukthar Ansari coming second polling 27.94 per cent and the Congress securing a mere 9.98 per cent of the vote. “Fascism comes at the time of an economic crisis” Prof. Prabhat Patnaik warned. Adding a note of caution, he said, “The social revolution taking place in the country for the last hundred years will be reversed if Modi comes to power”. That is the real agenda; it is not just communalism and fascism. Drawing a parallel with the situation that obtained in 1977, Prof. Patnaik said that no election since then has been so important. The fight in 1977 was against authoritarianism and for restoration of democracy. Now it is against the threat of fascism. “There is a difference between authoritarianism and fascism” Patnaik observed. The support of corporates to Modi is not without reason. Recalling that the same industrialists who were behind bringing Hitler to power in Germany, who were later given concentration camps to run, he said that those helping Modi will definitely reap the fruits once he is installed in power at the centre. Prof. Patnaik said that it is only the Left, which can take on these forces. “This is the example the Soviet Union gave to the world by defeating Hitler in the Second World War”, he added. Ridiculing the so-called “Gujarat model of development”, Prof. Patnaik said that Gujarat ranks down in human development index, whereas Kerala is on top. The growth in Kerala is not by giving concessions to corporates, unlike what is being done in Gujarat. Gujarat while giving huge concessions to corporates, has no funds for social sector spending. Huge tracts of land have been given to corporate houses at cheap prices. The Tatas were given huge concessions for shifting their Nano factory to Sanand in Gujarat. Speaking at the same convention, well-known social activist, Teesta Setalvad said that “it is only those who talk about the interests of the workers and peasants” who are eligible to rule the country. As opposed to the “development” that is being projected in Gujarat, in fact it is communalism, terror and hatred that have grown there, she said. Drawing attention to the murder of BJP leader Haren Pandya, she said that anyone who dares to oppose Modi or expose him, is silenced. All honest police officers, who stood up against Modi, have either been transferred, shunted out or have their pensions stopped. Teesta Setalvad herself has been at the receiving end of such attacks with several fabricated cases foisted against her. Teesta Setalvad also blamed the media for its one-sided, biased and distorted coverage. When a group of Bollywood personalities issued an appeal to the people of the country to vote for secular candidates, the corporate media instead of giving coverage said that Bollywood is divided. “It is not just Bollywood, the whole nation is divided” on this issue, Setalvad underlined. Besides state secretary of the CPI(M), SP Kashyap and CPI(M) candidate from Varanasi Lok Sabha seat, Hiralal Yadav, other prominent persons who spoke at the convention included Prof. Akhilendra Pratap Singh of the Indian People’s Front, CPI district secretary Jaishankar Singh, all India president of the Janawadi Lekhak Sangh, Doodhnath Singh, UP state secretary of the Progressive Writers Association, Sanjay Srivastava, retired professor M.P Singh and Mahendra Pratap Singh of the Varanasi unit of the JLS. Varanasi has supported Communists post-independence. In 1967, CPI candidate Satya Narayan Singh was elected MP from Varanasi. Udal of CPI was a nine-term MLA from Kolassala (Varanasi), Rustam Satin of CPI a three-term MLA from Varanasi South constituency, Raj Kishore of CPI(M) a two-term MLA from Gangapur constituency, later won by Deenanath Singh Yadav in 1991. This time the CPI(M) candidate is its Varanasi district secretary, Hiralal Yadav. Under his leadership the Party has led several agitations against the arbitrary acquisition of agricultural land by Coca-Cola. The Party had also led a successful movement against acquisition of agricultural land for the construction of a Hi-Tech city apart from organising big protests against the creation of an SEZ in Varanasi. It was in this city that Sant Kabir and Sant Ravidas lived. Their influence and imprint on the city continue, hyper-Hindutva notwithstanding. It is the secular traditions of the city which the Left wants to uphold. These are what Varanasi is all about and not what the Brahmanical-Hindutva mould to which the BJP intends to push the city into.